Brian Martin's article in Ad Age is a primer on what make successful brands. "The most-successful brands don't focus on what we need; they focus on what we want." So according to Brian, what do people want, exactly? To feel safe and secure. To be desired by others. To be free to do what we want. To grow and become more. To serve others and give back. To be surprised and excited. To believe there is a higher purpose. To feel that they matter. Click on the image to enlarge it. 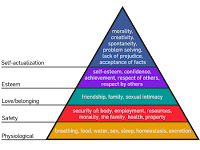 The image illustrates Maslow's hierarchy of needs which provides an understanding of what motivates consumers to interact with a brand. Hmmm... similar.